. Here we list common causes of plumbing problems related to improper plumbing vents. We describe how to track down and correct these "gas odors" in buildings with a focus on homes with a private onsite septic tank but including tips for owners whose home is connected to a sewer system as well. What makes the smell in sewer gas? Sewer gases are more than an obnoxious odor. How to prevent or cure sewer gas odors from septic systems, building plumbing, & other causes. Sewer gas smell Septic gas smell diagnosis - plumbing checklist. What causes that gurgling noise in a sink, tub or shower drain, and why do some fixtures "gurgle" when a toilet is flushed nearby? Here are the answers. 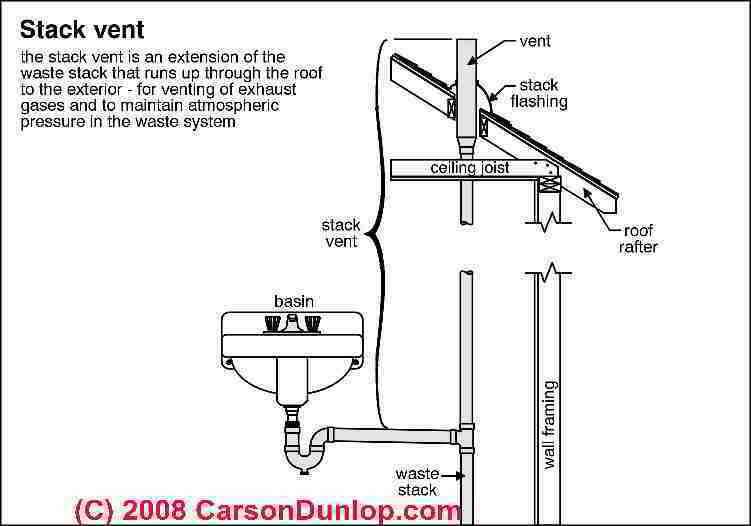 Our page top sketch of a plumbing stack vent and other sketches included below are provided courtesy of Carson Dunlop Associates. At left is a plumbing vent installed on an angle, making us question the workmanship of this job and raising an alert for other plumbing vent snafus. Plumbing drain or sewer gas odors: If you smell sewer gases in your building conditions could be dangerous (risking a methane gas explosion) or unsanitary. Watch out: Because sewer gas contains methane gas (CH4) there is a risk of an explosion hazard or even fatal asphyxiation. Sewer gases also probably contain hydrogen sulfide gas (H2S) In addition some writers opine that there are possible health hazards from sewer gas exposure, such as a bacterial infection of the sinuses (which can occur due to any sinus irritation). Depending on the sewer gas source and other factors such as humidity and building and weather conditions, mold spores may also be present in sewer gases. Plumbing drain or fixture noises: Other advice about controlling plumbing noises in buildings is at PLUMBING DRAIN NOISE DIAGNOSIS and also at SOUND CONTROL for PLUMBING. Missing, inadequate, or improperly installed drain-waste-vent (DWV) piping in the building: sometimes a building drain system has inadequate or missing plumbing vents. We list a variety of plumbing vent defects in this article. Our first photo (below left) below shows our client observing a very questionable plumbing vent on a new house. The vent is so far from vertical that we wondered if it had been connected to anything inside, and even if it was, we took this detail to suggest work by someone who lacked proper training - so we were alert for other plumbing defects in the building. Plumbing vents outside but by a window or door: Just as is shown in the second photograph (above right), plumbing vents which terminate outside but right next to an upper story window permit sewer gas entered the room when the window is open. Our photos above show how we simply raised the screen back up to open an old sheet-metal vent. 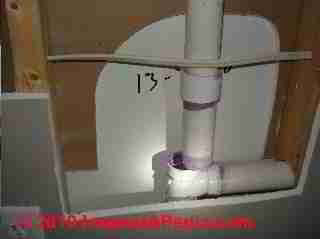 Leaking plumbing vent system piping: check that all of the pipe connections in the building's plumbing vent system have been properly made and sealed. Particularly with plastic piping it's possible for an installer to push vent pipe sections together while forgetting the glue. 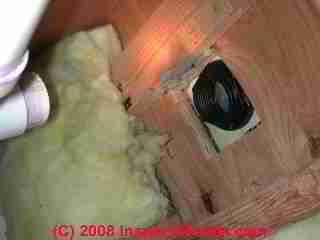 Our plumbing vent stack leak photographs above and just below show a hidden plumbing vent leak in a building wall cavity - exposed by drywall removal during an odor investigation, courtesy of reader Cheryl Lidawer, show what happens when plumbing vent pipe connections are not properly made. In this case the installer coated the pvc vent pipes with primer but not glue, then assembled them. After lots of detective work and difficulties tracking down sewer gas odors in this home, the owners found multiple sewer gas leaks including the one shown in the two photos above, inside of the building wall cavity. The defective vent piping and sewer gas leaks were discovered by pressure-testing the plumbing drain-waste-vent system. suspecting odors traveling through heating air ducts - was sewer gas or LP gas leaking into the duct work? confusion about odor and plumbing error responsibility among multiple contractors. of MIXED PVC/ABS PLASTIC VENT AND DRAIN PIPING [Image] in an older home. While modern glues can secure PVC to ABS plastic, in older homes, before such adhesives were available, a mix of black ABS and white PVC drain waste vent piping often meant leaks due to incompatible glues. 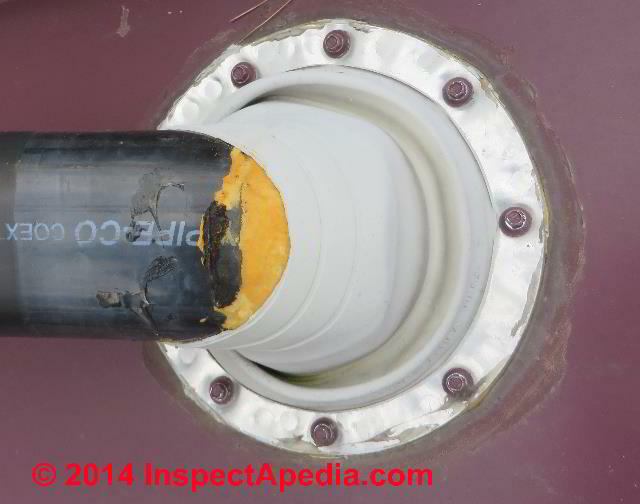 Don't assume mixed plastic piping is properly secured. this UNSAFE ELECTRICAL WIRING [Photo] found in the same building attic as the chopped off plumbing vent pipe. .
Because a plumbing vent is passing only sewer gas, not liquid waste that causes a drain not to function, no one notices that it's leaking into the building until there is an odor complaint, the pipe falls apart (which may never happen), or there is a sewer gas explosion. An experienced plumber may spot a loose vent piping correction quickly, especially in an attic or basement. It helps if you've already traced the sewer gas smell to its strongest location. In the Lidawer sewer gas odor diagnosis case described just above, pressure testing the plumbing system disclosed un-glued drain-waste-vent piping joints. Missing plumbing vents: I've seen systems with no vents at all - which often leads to sewer gases reentering the building through sink and shower traps. Plumbing vents which are too short in their above-roof projection can be blocked by snow and ice in freezing climates. 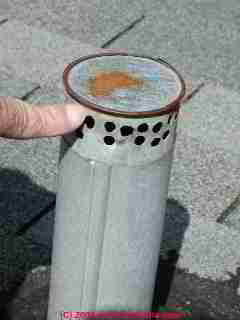 Plumbing vents which are blocked by ice freezing inside the vent line: in freezing weather if a lot of water vapor is passing up the vent line, for example from long steamy showers or perhaps from a hot water fixture left running or leaking into the drain system, frost can form in the vent piping where it passes through a cold attic and outside. When the frost becomes heavy enough it can block the plumbing vent system completely. In freezing climates, check that a plumbing vent is not being blocked by frost or by snow-cover. Waste line sounds heard in piping or at plumbing fixtures, such as "drain gurgling" or "glub glub" sounds, or similar noises may indicate defective or clogged plumbing. Watch out: snow and ice can rip a plumbing vent right off the roof, risking both roof leaks and plumbing vent condensate leaks into the roof structure or other building areas. See an example at SNOW GUARD FAILURES . at REMEDIES for SEWER ODORS, PLUMBING. Transite pipe plumbing vents - [photo just above] an cement-asbestos material, can become delaminated and clogged with age, blocking the plumbing vent system. See TRANSITE ASBESTOS CHIMNEYS, DUCTS, PIPES [Photograph courtesy of Roger Hankey]. Plumbing vents terminating indoors: As shown in the photograph just above, we sometimes find plumbing vents which terminated in the house attic rather than being vented outside. The plumber didn't want to cut the hole in the roof, perhaps because she didn't have the proper tools, ladder, or roof vent flashing at hand. We've also found plumbing vent lines that had been cut indoors where a fixture was removed or moved, leaving an open vent line that should have been capped or sealed. Check for blocked building plumbing vents such as a vent blocked by an insect nest, birds nest, or even a dead animal. Incidentally, a dead animal anywhere in a building might be mistaken for a sewer gas smell as the animal decays. Live animals can block a plumbing vent too. We found a live frog in one building plumbing vent, right at the rooftop, as shown in this photo! In freezing climates, check that a plumbing vent is not being blocked by frost or by snow-cover. 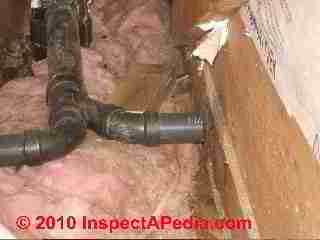 Noisy drain piping or plumbing fixtures: Drain-waste line piping sounds heard in piping or noises heard at plumbing fixtures, such as "drain gurgling" or "glub glub" sounds, or similar noises may indicate defective or clogged plumbing or even if the drains are not clogged, odors and noises are often caused by blocked or improperly installed plumbing vent piping. At PLUMBING DRAIN NOISES we explain the basics of proper plumbing vent piping and how errors cause trap siphonage, odors, and noises. We discuss how to diagnose and cure drain sounds in that article. at SOUND CONTROL for PLUMBING. Plumbing vent distances to fixtures: Plumbing codes require that plumbing vent lines be installed sufficiently close to plumbing fixtures to vent those drains (typically 5' or less) and that the vent system conducts any sewer gases outside and above the building (not in the attic). See PLUMBING DRAIN NOISES for details. Plumbing trap arm too long or not properly sloped: can cause plumbing trap siphonage and lead to both poor drainage and sewer gas odors in buildings. House Traps, Vents, and Sewer or Septic Gas Smells: Some residential plumbers like to install a trap in the main house sewer line at the point where the line exits the house wall to head for the septic tank. Such traps may protect copper waste lines from corrosive sewer gases. They also may prevent gases from a septic tank from passing back up the waste line and up the house plumbing vent stack. Our photo shows a sewer line vent through the building exterior wall. Sewer gases exiting this vent empty next to anyone seated on the chair that has been placed on the patio that was added long after the house was built - a condition that was not anticipated by the installing plumber. Below are details from the original plumbing vent installation of a 3-inch ABS plumbing vent through a standing seam metal roof. We had installed a conventional plumbing vent stack and boot (below left) along with a roof membrane, while waiting for the metal roof to arrive at the jobsite. To properly seal the plumbing vent to the metal roof we replaced the shingle-roof type vent flashing with the white rubber flashing shown at below right. 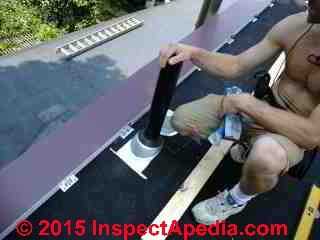 That flashing is sealed to the metal roof surface by both adhesive sealant and a ring of metal screws. Photos courtesy of Eric Galow, Galow Homes in Poughkeepsie, NY. At below left you'll see that even with the plumbing vent stack broken and bent over nearly touching the roof surface, the rubber boot installed in the photos above managed to avoid a flood of melting snow into the roof cavity. 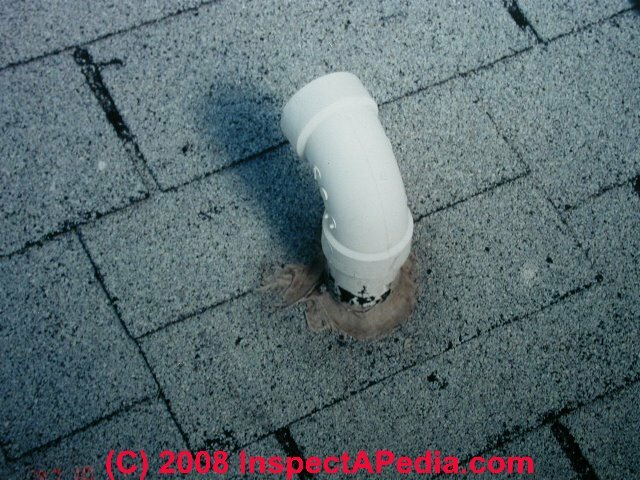 This broken plumbing vent was caused by the property-owner's reluctance to finish the job of installing snow guards on the roof. and at CLOGGED DRAIN DIAGNOSIS & REPAIR. Watch out: while the 2015 IPC is the most-recent version of the International Plumbing Code, while the 2018 IPC is under development. To understand which generation of the model building code or plumbing code applies to your specific project you will need to check with your local building official. For example many jurisdictions are on the 2012 IPC or still older versions. The International Plumbing Code (IPC) is a proven, comprehensive model plumbing code that works seamlessly with ICC's family of building codes. It sets minimum regulations for plumbing systems and components to protect life, health and safety of building occupants and the public. 2009 IPC ICC International Plumbing Code, [PDF] full text, retrieved 2016/08/11, original source: https://law.resource.org/pub/us/code/ibr/icc.ipc.2009.pdf as adopted and incorporated by various U.S. states including Alabama, Colorado, Delaware, Florida, Michigan, New Hampshire, North Carolina, Ohio, Oklahoma, Pennsylvania, Rhode Island, Utah, Vermont, Virginia, West Virginia, and others. 2006 IPC ICC International Plumbing Code, [PDF] full text, retrieved 2016/08/11, original source: https://law.resource.org/pub/us/code/ibr/icc.ipc.2006.pdf as adopted by various U.S. states and municipalities including Arizona, Arkansas, District of Columbia, Georgia, New York, South Carolina, and others. International Mechanical Code (IMC), International Code Council  422-7233, Op. Cit. International Plumbing Code (IPC) (see NPC below), Op. Cit. We had High Definition Roofing Timberline installed over 3 tab asphalt roofing.The flashing &vent piping were not redone & still leak. 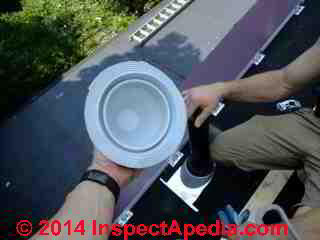 WE purchased new flashing for vent pipes & chimney & swamp cooler. What would be the best way to install this new flashing over these 2 layers of roofing ? 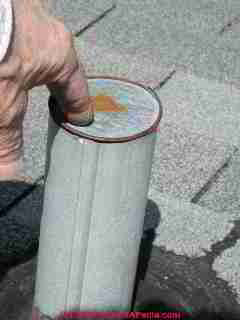 I was thinking of removing the few appropriate courses of HIGH Definition Roofing install the new flashing then cutting out the new Timberline asphalt shingles appropriately & replacing it with the lower portion of flashing exposed & sandwiching it between old 3 tab & new high definition roofing using adhesive nails etc. As recommended on a new one layer roof. Can't seem to find info. 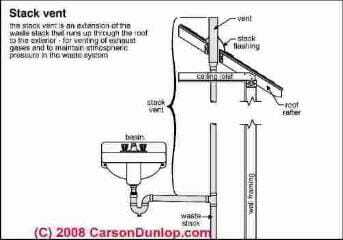 about this on roof overlayment. What is your recommendation ? Everyone asked seems to have different opinions. then install a new vent flashing boot and shingle over it with proper flashing positioning so that any water entering around the new flashing and boot is delivered atop the shingles down roof. For added protection you can include sealant both beneath and atop the top and sides of the new flashing boot. Question: removed plumbing vent, cut holes in roof for new vent - structural damage? We had our roof re shingled and had an electric vent removed and 2 new holes were cut to install 2 of the larger max vents. What is the correct procedure for repairing the hole in the roof where the old electric vent was removed. Also is there any chance of structural damage to the roof if approximately one inch x the length of the vent was cut off of the roof truss where the new vents were installed? Anon I can't say I've got a clear idea of the situation, but generally if we are removing something that leaves a hole in roof sheathing, before re-roofing we patch the hole, typically by a filler inside the sheathing opening (plywood? ), supported by additional plywood screwed to the sheathing underside from below. you're warned not to chop, hack, shorten or modify trusses as the truss strength is compromised. From what I *think* you are describing, if repair is needed it's probably minor. Continue reading at PLUMBING VENT DEFINITIONS & CODES or select a topic from closely-related articles below, or see our complete INDEX to RELATED ARTICLES below. PLUMBING VENT DEFECTS & NOISES - home at InspectApedia.com - online encyclopedia of building & environmental inspection, testing, diagnosis, repair, & problem prevention advice. Questions & answers or comments about how to control annoying sounds in buildings.